Summary: The adventures of writer Newt Scamander in New York’s secret community of witches and wizards seventy years before Harry Potter reads his book in school. Welcome back to the Harry Potter universe. Over the years many franchises have tried to tap into the young adult mark. Twilight, The Hunger Games, Divergent etc have come and gone, and yes they have all done well at the box office… but none quite as well as the behemoth known as the Harry Potter franchise. See where Potter could gloat over the others was the fact that its films were not only embraced by fans but also received critical acclaim as well. Yes there was more than just a few of us that were drawn into a world consisting of Hogwarts, muggles and spells a plenty. Now J.K. Rowling takes us back into the Harry Potter with Fantastic Beasts And Where To Find Them, this time there is even a more literal sense to that statement because for the first time in the franchise’s history Rowling puts on the hat of screenwriter… something it seems she should have done a long time ago. While Fantastic Beasts And Where To Find Them is set in the Potter universe don’t be expecting the re-appearance of Harry, Ron and Hermoine. No this is set 70 years prior to the trio’s arrival at Hogwarts and centres on another of Dumbeldore’s students – the young wizard Newt Scamander (Eddie Redmayne – The Danish Girl) who travels to New York on the simple mission of returning one of the magical creatures that he has rescued back to its rightful home. After an innocent mix-up with a baker who has dreams of setting up his own shop, Jacob Kowalski (Dan Fogel – Kung Fu Panda), some more of his menagerie escape into the Big Apple. There escape catches the eye of a recently demoted Ministry of Magic Detective, Porpentina Goldstein (Katherine Waterston – Steve Jobs) who immediately reports Scamander to her bosses Seraphina Picquery (Carmen Ejogo – Selma) and Percival Graves (Colin Farrell – Total Recall). They immediately believe that he is responsible for a spate of recent attacks that have put the magic world on the brink of war with the non-magics (America’s answer to muggles) and Scamander finds himself in a battle to not only protect his creatures but also find the real culprit for the attacks. Many fans of the original Potter franchise are going to find themselves in for a journey of differences this time around. While Rowling allows the story to share some familiarities with the original series, things such as those practicing magic not being understood or accepted by those who view them as different, an awkward young wizard out of his depth and the basic battle of good versus evil she also takes some bold steps this time around. Fantastic Beasts And Where To Find Them sees her tackle stories as wide as police corruption and child abuse. Perhaps the biggest surprise this time around though is the scale of the events that Rowling has dreamed up. Alongside her director David Yates (The Legend Of Tarzan) Rowling has conjured up events and a plot that at times rivals the action and scale of a film like X-Men or Man Of Steel. She also allows the film to capture the class and style of 1930’s New York remarkably well too. To her credit she pulls it off so well we can only hope that we see her take on the role of screenwriter many more times in the future. The other big surprise with this film is that despite its big scale action sequences and heavily slanted fantasy theme the film also allows for a great deal of characterisation. Without spending too much time on a tiresome ‘set-up’ of characters Rowling throws her audience in at the deep end with amazing results. You are quickly won of by the awkward Scamander while the comedic character traits of Jacob and Queenie (Allison Sudol – The Lucky One) quickly make them fan favourites. Romantic interests developing between Jacob Queenie as well as Scamander and Goldstein move the story along with the odd light moments sprinkled between the suspense around characters like Credence (Ezra Miller – The Perks Of Being A Wallflower) and Gellert Grindelwald (Johnny Depp – Pirates Of The Caribbean) keep the audience on the edge of their seats. This characterisation also allows some actors to step up in ways you wouldn’t expect to them in a film like this. Colin Farrell relishes being in a film of this scale again and manages to steal many of the scenes he appears in. It’s like he knows that roles such as this are rare for him these days and he excels whether he is called upon to deliver an action sequence or a more dramatic emotional scene. Eddie Redmayne also makes the role of Scamander his own but the real surprises here at the performances of Katherine Waterson, Dan Fogler and Allison Sudol who step-up onto the big stage in a huge way and really show their talents. Sons Of Anarchy fans should also look out for Ron Pearlman in a memorable cameo as well. While I’ll admit that I was eagerly awaiting the arrival of Fantastic Beats I never expected to enjoy it as much as I did. The fact that Rowling can deliver a film with this much action is a real surprise while it seems she has created more characters that are likable enough to become household names. With the other announcement that there will be four more films in this franchise all I can say is bring them on… I can’t wait. With the lucrative Harry Potter franchise done and dusted, author J K Rowling has expanded on her Potterverse with this stand alone tale set some seven decades before the adventures of the boy wizard. Fantastic Beasts And Where To Find Them serves as the launching pad for a new post-Potter franchise set against the world of magic and sorcery, and somewhat ambitiously another four films have been planned for the series so far. The film follows the misadventures of magizoologist Newt Scamander (played by Oscar winner Eddie Redmayne) who has just completed a global excursion for the Ministry of Magic to document the varied and amazing array of magical creatures in the world. He will go on to write the fictional text book that became mandatory reading at Hogwarts. But the time is now 1926 and the setting a pre-Depression era New York. It is also a time of heightened tensions between humans and the magical community, and suspicion, paranoia and intolerance that has driven most of the wizards underground. The magical community that keeps a low profile after the actions of dark wizard Gellert Grindelwald (a cameo from Johnny Depp). There is a secret society known as the Second Salemers that are leading a campaign to identify witches within the community. Scamander has stepped off the boat for a short stop over in New York. He carries with him a battered leather suitcase that contains some samples of strange creatures great and small. He accidentally bumps into klutzy wannabe baker and no-maj (the American term for a muggle) Jacob Kowalski (Dan Fogler), who is also carrying a battered suitcase containing samples of his pastries. They somehow manage to switch suitcases, and Kowalski accidentally unleashes some fantastic beasts onto the unsuspecting city. The release of the creatures attracts the attention of the Magical Congress of The United States of America, a sort of magic police force. Porpentina Goldstein (played by Katherine Waterston) is an auror, a dark wizard catcher, who has fallen out of favour with MCUSA and she sets out to redeem herself by catching Scamander and his creatures before they can bring harm to the city. She teems up with her mind reading sister Queenie (Alison Sudol), Scamander and Kowalski. But there is a mysterious threat to the city from some elusive and dangerous force that is also wreaking havoc. And the uncompromising Percival Graves (a sullen, sinister Colin Farrell), the director of Magical Security with MCUSA, also has his own agenda and is involved in some shady dealing with the troubled teen and ostracised wizard pupil Credence (Ezra Miller). Rowling has written the screenplay herself which is based on the short story she wrote in 2011 and published under the pseudonym of Newt Scamander. But it is a little convoluted and very busy with several subplots. There are a lot of ideas at play here but not all of it works. As usual Rowling has created a world that operates within its own set of sometimes flexible rules, and she has created a unique language. Fantastic Beasts has a dark and whimsical tone that is far removed from the lighter tone of the early Potter movies. The director is David Yates, who helmed the final four films of the Potter series, so he is familiar with the demands of the material. The action is dominated and overwhelmed by the impressive array of CGI effects in an effort to distract from the lack of cohesive narrative and well defined characters. Unlike the Potter series here we don’t get as emotionally involved with the characters. There are indeed some fabulous creations here, including a kleptomaniac platypus; but there is one creature that looks suspiciously like a deflated rubber toy! And the over the top finale almost destroys as much of New York as the Marvel characters. There are some nice performances though. Redmayne brings a boyish quality to his reading of Scamander, and he brings plenty of nervous energy, nervous tics and mannerisms to the character that are somewhat endearing. Farrell is gruff and taciturn as the sinister Graves but he also appears bored at stages. Fogler provides plenty of comic relief. Waterston brings strength and a feisty quality to her Porpentina, while singer turned actress Subol brings a perky energy to her role. Jon Voight is wasted in a small and thankless role as Henry Shaw, a powerful newspaper magnate leading a crusade against magic and wizardry. The film offers up a visually impressive environment, and it has been superbly shot by Philippe Rousselot, whose use of sepia tones imbues the material with a strong touch of nostalgia. The authentic period detail brings 1920s New York to life. Colleen Atwood’s costumes also add to the stylish and strong visual look of the film. The film’s themes of intolerance, paranoia, bigotry and suspicion will resonate strongly with audiences, especially given recent political events in America. But this is a flawed film, and whether Fantastic Beasts and Where To Find Them has the legs to support another four films in the series remains to be seen. You can listen to Nick Gardener’s Fantastic Beasts And Where To Find Them review from The Wednesday Motley Crew right here. 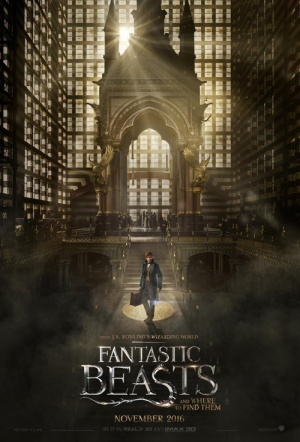 Fantastic Beasts And Where To Find Them, directed by David Yates and starring Katherine Waterston, Dan Fogler, Fine Frenzy and Eddie Redmayne, being with it the return of the Wizarding world we have all grown fond of from the Harry Potter series. I loved that this film, even while being part of the Harry Potter franchise, gave its own reputation. It didn’t rely too much on the success of Harry Potter to make this film successful. The characters were all cast perfectly, the film had some genuinely funny moments and the action, drama and of course the magic were all balanced out really well in my opinion. It was fantastic to see magic from the Wizarding world back on screen once again and at the same time bring concepts of the Wizarding world that were never discussed in Harry Potter. I loved that they kept this fresh and interesting with a whole new story line and broad range of new characters. In some movies I find myself getting bored towards the middle of the film but in Fantastic Beasts there was nothing that allowed me to be bored because there was constantly something interesting happening on screen. The scenery, special effects and all over direction of the film was done really well and I highly recommend going and seeing the film if you are a Harry Potter fan. Other Subculture Entertainment Fantastic Beasts And Where To Find Them Reviews: You can also listen to our Fantastic Beasts And Where To Find Them reviews on The Good The Bad The Ugly Film Show Ep #202. You can listen to Dave’s Fantastic Beasts And Where To Find Them review on the 10/11/2016 episode of That’s Entertainment.